Tentworld: How do you setup a OZtrail Deluxe Gazebo? How do you setup a OZtrail Deluxe Gazebo? The OZtrail Deluxe Gazebo - Australias most popular outdoor portable gazebo. Get a friend to help you, or a neighbour at the camp site! Extend gazebo frame out half way. Throw gazebo canopy over the top and match the velcro on the canopy to the corners. Extend gazebo frame right out until frame is locked in position and canopy is tight. Adjust gazebo canopy to ensure canopy is tight. Extend canopy height to desired position. To pack it down reverse the above! Watch the following video, showing you a demonstration on how to set up a OZtrail Deluxe Gazebo. Remember when camping with your gazebo, if it starts raining be mindful of the need to adjust your storm ties, and if water pooling occurs to remove it. If winds get very high, try reducing the height of your gazebo. This will sometimes reduce the weight load on your gazebo frame. 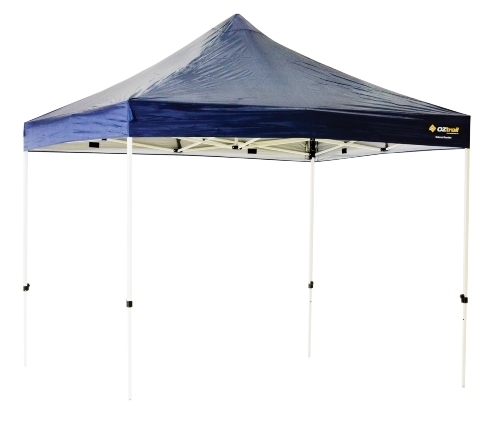 For pricing, and specification of the OZtrail Deluxe Gazebo click here! Enjoy the article? Leave a comment below! 80 of the best first time camping tips from campers around the world! How to tell how full your gas bottle is! Got Gas? This is an easy way to tell. OZtrail Blitz Tents! Quality super fast pitching tents! What size Engel or Waeco do I get? Powered by Tentworld 1300 836 896. Simple theme. Powered by Blogger.